What does it take to be on top at Zameen.com? 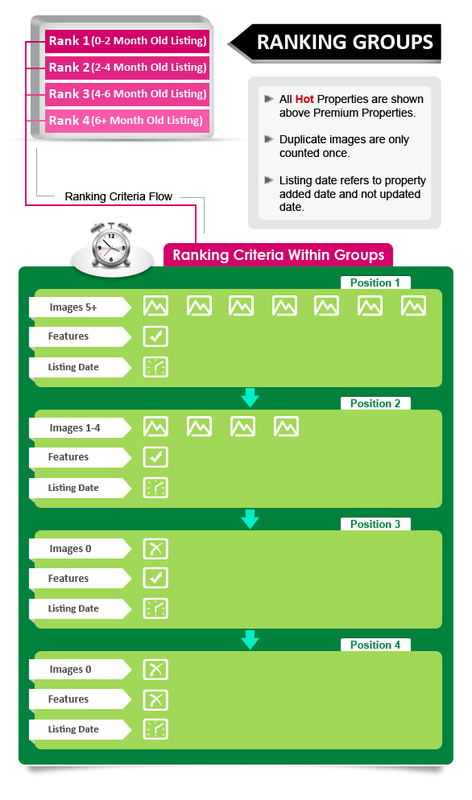 A lot of estate agencies, registered on Zameen.com, have confusions about the portal’s ranking criteria. We have decided to make things clearer for them by explaining every bit of the process that leads certain properties on the top rank at Zameen.com. Freshness: Recently added properties are shown higher in the list. The top ranked properties have to be 0-2 months old. For every listing older than two months, the ranks drop. Hot Properties: Among all premium listings, Hot Properties get the highest ranks on Zameen.com. Images: The best ranked properties on the portal have to have more than 5 images. Duplicate images are counted only once. Features: While uploading your property listings, Zameen.com help you advertise it better with the help of a form that includes property’s features. If you include all the listed features of your property and follow the above mentioned criteria, you can be sure of getting the top ranks on the portal. The following infographic is meant to make you understand the process more clearly.